AnyDesk Software GmbH, technology leader in remote access software, released the new version of the fastest and most affordable solution on the market: AnyDesk 5.0. The new version provides users with a series of new features and upgrades, including a new user interface that makes working with the application easier and more intuitive. AnyDesk also listened to feedback from users, providing an auto-add function for the address book that makes expanding your contact list so much simpler. 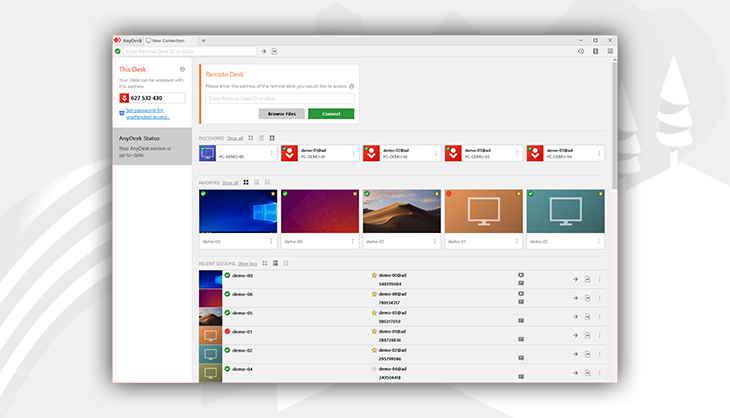 Remote printing has been added along with auto-discovery functionality, allowing users to automatically detect other AnyDesk clients in their local network. The new on-screen whiteboard enables users to communicate with their counterparts via graphic elements, complementing the already-existing real-time chat. Version 5.0 also brings an update to AnyDesk’s licensing policy so every business can find a model that suits them in one of the three different levels: Lite, Professional, and Power. Lite is ideal for a small business or a freelancer with its unlimited endpoints from a single device and the new features of Version 5.0 along with all of AnyDesk’s previous benefits. If customers need to use multiple devices to connect to endpoints, then the Professional plan is right for them, also bringing custom aliases, session logging, and special admin features. Finally, the Power plan allows for three active devices and unlimited concurrent sessions, perfect for when you need to access a large pool of devices simultaneously. “With the release of AnyDesk Version 5.0, we further strengthen our positioning in the market as the lightest, fastest, and most affordable remote desktop solution available, offering our customers an even smoother and more effective user experience. The new version and our tiered licensing model will enable our customers to always find the best fit for their needs,” said Philipp Weiser, Chief Executive Officer of AnyDesk Software GmbH. AnyDesk was founded in Germany in 2014. Its unique remote access software has been downloaded by more than 100 million users worldwide, adding another 5 million each month. The software is based on the company’s unique proprietary codec, DeskRT, that allows for virtually latency-free collaboration whether you’re down the hall or on the other side of the world. AnyDesk is one of the 50 fastest-growing businesses in Germany and its technology is trusted by millions of people and more than 15,000 companies in 165 countries, including world-renowned Fortune 500 brands.